Hib Halverson's C5 Articles - Great Stuff! Get under your car and look at the driver's side tail pipe. Follow it back to where flanges are bolted together. Your Job Number is laser-engraved on both flanges. When your car is built, your Job Number will be a gold-colored four-digit number stamped on your tires. BUT, the first time you detail your tires, you will wash away the Job Number. Now that you have climbed under your C5, looked at your front frame wall, and inspected your tires, we'll tell you the easiest location to find your Job Number! Open your back hatch and pull up any of the three compartment covers. There you will see your Job Number on a sticker. The number will preceded by SEQ NBR . For instance, if the sticker reads SEQ NBR 6063, then 6063 would be the Job Number for your vehicle. Why is it important to know your Job Number? Remember, your Job Number will not match your VIN Number. The reason is that when prototype/pilot cars are built, even though they may be a 98 model being build in 97, they fall in sequential order with a job number. If your car is ever stolen and the VIN Number altered, you can still provide a positive ID on your C5 by knowing the Job Number. Knowing where to locate a Job Number can help you to identify original C5s. In 20 years, if you are approached about purchasing an original C5, you can use the Job Number information to identify true original parts. 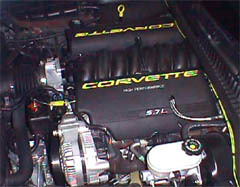 With no lids for the three storage areas they have made finding the job number on a Z06 a little exciting. Now follow with me on this. 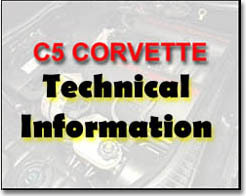 An easy place that we have found to locate the job number for a Z06 is to open your hood. On the passenger side by the battery, there is a gap between the battery and the inner fender wall. If you look straight down you will find several groupings of wires that run slightly below the battery tray. What you're looking for, is the white tags that are wrapped around the wiring groups (there are several wiring groups, so you have to look at each one). Our experience shows that only TWO of the wiring groups have a white tag that starts with SEQ NBR and then a long number, usually starting with lots of 0000000's. But now that you've looked at every wiring harness, there may be even an easier location to look on and that is to look down on the small silver box below the wiring harnesses and you will see a white sticker with SEQ NBR and then followed by several numbers. These numbers are located on top of the silver ECM control module/computer. Also for a last ditch location, the JOB NUMBER is laser etched onto the flanges where your titanium exhaust bolts to the stainless steel pipe coming from the catalytic converters, but of course your C5 needs to be in the air to see this.